Happiness is the most significant preoccupation of mankind and is of universal interest. This fascinating book closely examines the medical and biological basis of happiness. Life is 99% biology and so is happiness! This book aggressively searches for the most intimate neurobiological underpinnings of happiness. It examines anthropological and philosophical approaches to enhance our state of happiness. The most daring aspect of this book is its determined effort to unmask the unreality of religious wishful thinking, spiritual "mumbo-jumbo", and the traditional psycho-babble that is served in huge helpings to the general reading public. The author has tried to stick to scientific data; to tell it as it is; all with the goal of helping us to learn to cope with the stark realities of our lives. Dr. Claude Maranda is Physician-in-Chief at the Centre Hospitalier Angrignon which is affiliated with the University of Montreal. He was formerly Clinical Cardiologist at Royal Victoria Hospital, McGill University. He has 22 years of experience in clinical medicine, university clinical teaching, administrative responsibilities and medical research. Dr. Maranda attended the University of Ottawa where he obtained his Bachelor of Arts and medical degrees. He received specialty training in Internal Medicine and Cardiology at McGill University. Dr. Maranda's book is unique in a marketplace saturated with books elaborating on subjects related to happiness, however, no other author addresses the issue so directly and specifically. You owe it to yourself to read this fascinating book and learn about your own Biological Happiness and find out about Nature's Secrets for Successful Living. 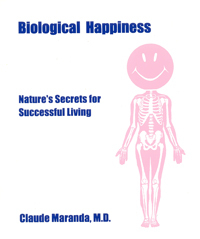 Biological Happiness: Nature's Secrets for Successful Living by Claude Maranda, M.D., 404 pages; softcover; ISBN 978-1-55270-024-2; published in 1999; Canadian $48.95.